The space colonized by Terragen mindkind stretches thousands of light years from Earth in every direction and is expanding outwards at close to the speed of light as further systems are settled on the Periphery. This region, known as the Terragen Sphere, occupies billions of cubic light years, from the densely settled, industrialised, and historically rich Inner Sphere, through the Middle Regions, containing the centers of the most relevant empires today, to the more sparsely populated Outer Volumes. Many of the most important systems in the innermost parts of the Terragen sphere are linked by a nexus of wormholes stabilised by exotic energy; however the outermost parts of colonised space are generally not yet connected to this network. 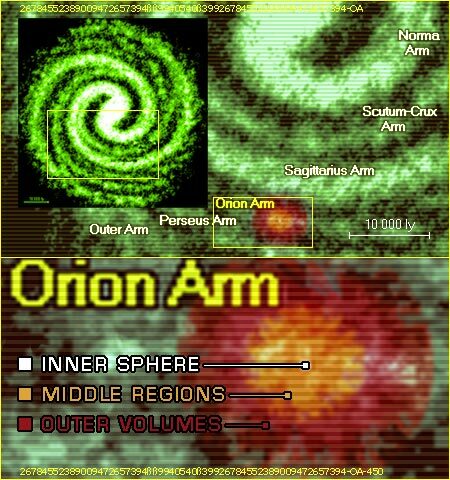 Most of the colonised and inhabited systems are found within the thick disk of the Milky Way Galaxy, centred on the Orion Arm or Spur, a relatively galactic feature. 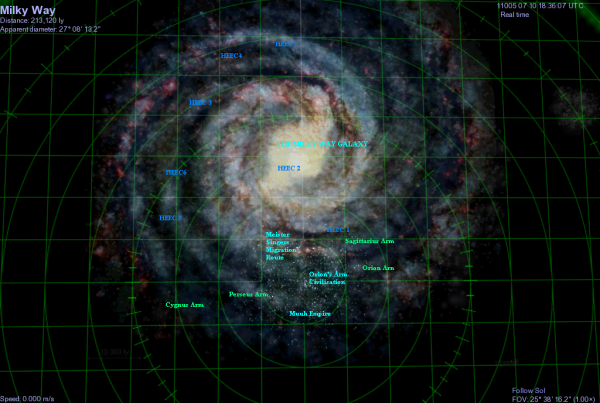 However, Terragen expansion extends towards the centre of the galaxy, into the nearby Sagittarius Arm and also into the Perseus Arm towards the rim. Although star systems above and below the galactic disk are generally few and far between, enterprising colonists can be found even here, with inhabited space extending out to a distance of several thousand light-years. Politically, the Terragen Sphere is divided into meta-empires and empires together with a vast number of minor independent polities. Members of the civilised galaxy can generally be expected to adhere to the Tragadi Accords. The majority of bionts, as well as those AI who remained, eventually founded what today might be called the Sephirotic Alliance. All adhering polities have high standards of Sentient Rights, and are historically connected by the Second Federation and ComEmp ontologies. Together, they administer nearly a third of the total star systems in the Terragen Sphere. Some groups of sophonts try to avoid contact with the larger civilisation, often for fear of transapient interference. These groups include Backgrounders, Hiders or Leavers depending on their strategy and success. The Refugium Federation is an example of a multi-system polity coming out of hiding in 6916. The Amalgamation. An aggressive empire in the Perseus Arm, by now contained by the Perseus Arm Defence Organisation (Note: it is theorised by some that the Amalgamation may be, in part, of xeno origin). The Arion Ascendancy, an expansive cyborg empire in the Outer Volumes. The Efficiency Maximisation Paradigm, an aggressive empire during the first half of the sixth millennium. No major conflicts with this faction have occured since the Jekaumeatrine Accords of 5559. The Transcend, mostly non-aggressive empire of unclear origin. The Xeon, aggressive cyborg empire in the outer volumes. During their expansion the Terragen have come across not only garden worlds with native ecosystems, but xenosophont civilisations, some extinct, some still extant. The Terragen Sphere currently shares borders with the remains of the ancient empires of the Muuh and the Soft Ones. At the border in the Perseus Arm a joined culture is emerging. The Terragens have also met (in deep space) representatives of the Meistersingers together with their Wayfarer allies in 9203 AT. Other advanced civilisations in the Milky Way can be inferred from their transmissions. Detailed information has been received from the Pas'u'turil, for instance. The Menexenes (8826 AT), homesystem now isolated, expats found in several colonies. The Jade Chime Singers (9953), originally sub-sophont. Provolved and later integrated around 10377. It is common for short summaries of worlds, habitats, stellar systems, or polities to include a Hazard Rating. The standard modern version is a ten point scale.